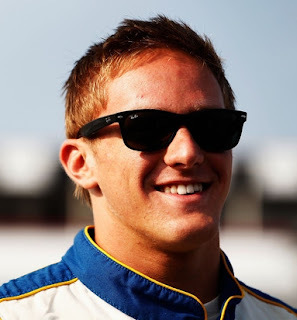 After a tumultuous 2012 season that saw him drive in both the Nationwide and Camping World Truck Series’ for Penske Racing, Brad Keselowski Racing and Red Horse Racing, expect an announcement next week that Parker Kligerman will compete full-time on the Nationwide Series for Kyle Busch Motorsports in 2013. Kligerman was released from Penske’s No. 22 Nationwide Dodge in early August in favor of Ryan Blaney, and departed BKR’s Truck Series operation shortly afterward, also in favor of Blaney. He won for Red Horse at Talladega Superspeedway in only his seventh start. KBM General Manager Rick Ren was unavailable for comment today. John Wes Townley will reportedly fill Kligerman’s vacated seat next season, running the full NASCAR Camping World Truck Series schedule in 2013 with Red Horse Racing. Townley competed in 21 of 22 Truck Series races this season, finishing 16th in points despite missing the season opener at Daytona International Speedway. While he managed only two Top-10 finishes in those 21 starts, he showed dramatic improvement over previous seasons, sustaining only two crash-related DNFs. He will reportedly carry his family-based Zaxby’s sponsorship to Red Horse Racing, driving the No. 7 Toyota that won twice this season, including the season-opener at Daytona with driver John King. Mark, you are not authorized to repost content from GodfatherMotorsports.com, with or without "credit." Your page includes a large amount of content stolen from GodfatherMotorsports.com, JAYSKI and other copyrighted sites. Kindly remove any and all content taken from this site immediately, in order to avoid legal action. Thank you. I hate to see drivers lose their rides, but I was elated to see Ryan Blaney get a real shot to show his talent. Glad that Parker K. is going to land on his feet. On a side note...if some one wrote "I was reading about Parker K. getting a new ride for 2013 on GodfatherMotorsports.com"...and then made my own comments, is that still considered wrong?